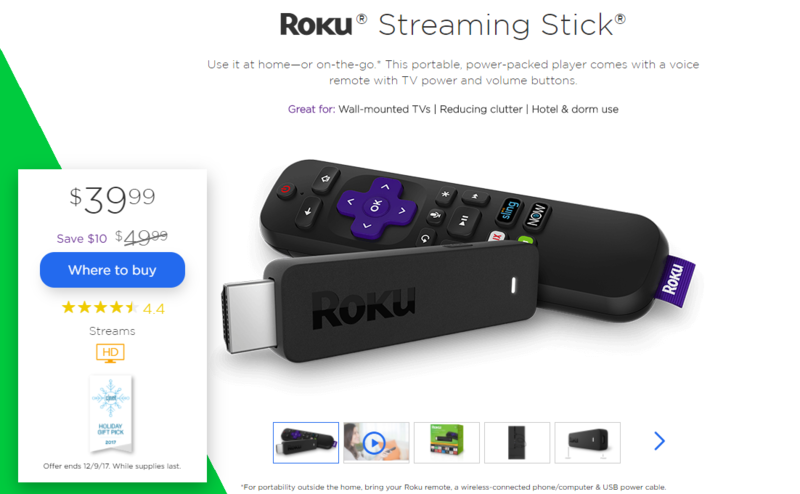 If you're still a little behind on your Christmas shopping or if you got a new TV during Black Friday and are looking for a relatively inexpensive way to make it smarter, there's a neat deal for you today: Roku is discounting its new (2017) Streaming Stick from $49.99 to $39.99. It's only $10 but this is a nice 20% off a new product. When Corbin reviewed the new Streaming Sticks from Roku, he liked their small size and praised their speed, software, and remote. He also liked that you could view plenty of streaming services, including Amazon Prime Video and Google Play Movies and TV on the same unit (many other similar offerings lack one or the other). He's not alone, the Streaming Stick has an average 4.5 rating on Amazon right now, so it's quasi-universally loved. The one downside is that since this is the regular Streaming Stick, it only supports streaming up to 1080p at 60fps, but that may not be a deal-breaker if your TV doesn't have 4K or HDR. Other than that, the Streaming Stick is similar to the Stick+ with dual-band MIMO 802.11ac Wi-Fi, voice search and TV controls on the remote, and private listening through the Android app. The Streaming Stick was announced at $49.99 in October, but it didn't go on sale during Black Friday (the Stick+ was discounted). Now it's down to $39.99 at various retailers, with the deal lasting until December 9. If you're interested, you can find the links below.